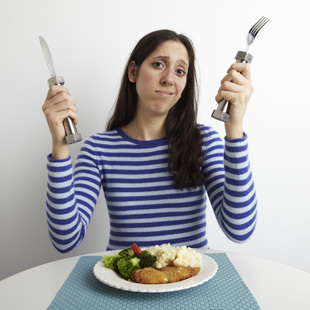 When it comes to dieting, who isn’t looking to lose weight as quickly as possible? In our quest for a quick fix, we latch on to diet notions that may or may not be true (Can You Safely Lose 10 Pounds in 10 Days?). Here are 3 diet myths that may be sabotaging your weight-loss efforts. Weight-Loss Myth: It doesn't matter what time you eat dinner. Truth: The early-bird special is good for your waistline and your overall health. According to a recent study in Cell Metabolism, mice that eat an early dinner and then fast for 16 hours are slimmer than those who eat the same amount of calories, but snack around the clock. Researchers suspect that the longer lapse between meals allows the body to process the food more efficiently. They noticed that even mice fed a high-fat diet gained less weight when they fasted for 16 hours than those who ate more frequently. What’s more, people who eat late at night tend to eat more, according to Dr. Louis J. Aronne, director of the Weight Control Program at Weill Cornell Medical College-New York Presbyterian Hospital. In addition, studies show that late-night noshing increases triglyceride levels, a type of fat found in your blood. When you eat, your body converts any calories it doesn’t use right away into triglycerides; high levels of triglycerides may increase your risk of heart attack and stroke. Weight-Loss Myth: A calorie is just a calorie. Truth: Emerging research suggests that a calorie may no longer just be a calorie: last year a study published in the Journal of the American Medical Association found that after dieters lost weight, their metabolism slowed the most (not what you want if you’re trying to lose weight) when they ate a low-fat diet and the least on a low-carb diet (eating a low-glycemic-index diet slowed their metabolism moderately). For this particular low-carb diet, participants ate 10 percent of their calories from carbohydrates (60 percent from fat and 30 percent from protein). And some experts agree about this myth: Robert Lustig, M.D., a pediatric endocrinologist at the UCSF Benioff Children’s Hospital, famously called sugar, which is a carbohydrate, a poison in a medical lecture that went viral in 2009. He explained that calories from different foods react differently in your body, making some calories “higher quality” than others, especially if you’re trying to lose weight. “A calorie is not a calorie. Low-sugar, high-fiber foods cause lower blood sugar peaks, less insulin release and less weight gain,” said Lustig. Weight-Loss Myth: Eating multiple, small meals each day is best for weight loss. Truth: You’ve probably heard many experts say it’s best to eat mini meals every few hours. The theory is that eating frequently may help curb your appetite and stabilize your blood sugar—preventing the dips that leave you feeling hungry—which makes slimming down more doable. But most of the research doesn’t support this notion and suggests that grazing on multiple mini meals won’t promote weight loss any more than sticking to three squares. In a recent study, published in the journal Obesity, when overweight or obese dieters spread a very-low-calorie diet over six meals, their appetite and hunger were no different than when they ate the same diet in three daily meals.